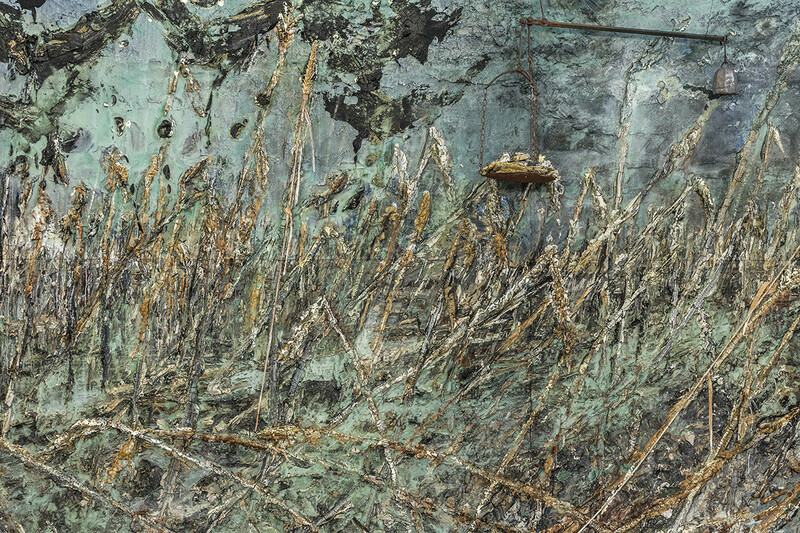 There is a dark illumination beneath the beauty of Anselm Kiefer’s series of paintings, “The Morgenthau Plan”. The Morgenthau Plan was conceived in 1944 by the U.S. government under FDR. Henry Morgenthau was the secretary of the treasury during the third term of the Roosevelt administration. The idea of the plan was to transform Germany into a pre-industrial agricultural nation after their defeat in WWII. The idea was to dismantle the German sites of industry and prevent them from ever again gaining enough global power to wage war. Veiled behind the image of a beautiful nation of natural spectacle and flowers, the proposed plan would have led to the systematic death of 10 million Germans by starvation and disease. “I had these wonderful photographs of Barjac, of flowers, fields of poppies, all kinds of flowers, like those you find in Monet’s paintings. I liked these photographs very much. There is a strange movement that we see in Kiefer’s work – the appearance of beauty or something that appears to be hope, immediately met with an underlying rumble, a distrust, a corruption. Kiefer continues to make new connections between things, between events in history and our ability to see them. His work continues to unfold through impact into intellect, revealing layers of complexity and implication that call for discussion. He is a building a body of work that functions as a spiritual guide through trauma of the past, and revealing what repeats itself through history. His work is timeless as much as it deals with time, it looks forward as much as it looks back. I wonder how much his engagement with the Morgenthau Plan contributed to the title of his documentary “Over Your Cities Grass Will Grow”. Seen in this light, the Morgenthau plan becomes an illumination of our ultimate futility of industrial enterprise at all. There is the conception of a future in this title – the grasses will grow. Our progressive march into the future may be a self-destructive path that will end our civilization before the finite time on earth is up, over our cities grass will grow. Beauty will emerge from destruction – the emergence of beauty becomes the signal of a decimation. Thanks for following the blog! Your site looks really cool too – I’ll have to spend some time reading your mythology posts.